I’ve got a fair bit of time now to bring you guys and girls up to speed if you haven’t been able to see the layout in person, though I don’t know how many photos I have on my phone to share. Anyhow, here’s the story. Meanwhile I had also been working on the track into the former engine house at Port Alberni. Using two or three different thicknesses of styrene sheet, and a large amount of styrene cement (I was pouring it out of the bottle to get it to laminate the sheets together…) I was able to get the foundation started. I’ll need to build more up to match the rail height, but for now I just needed to get the only the rail level to what was coming in from outside. Unfortunate that I didn’t take more progress pictures of that specific detail. Following that, I wired up the remainder of the yard trackage and the plywood division to the track bus, so the full yard was powered. But over the week between Christmas and New Years, both Cam and I were off work and we got those two bits of track installed, clean things up and finalize the trackage between the Plywood Division and the Port Alberni yard. I of course would leave a few spikes out. The first day of 2016 would be the final spike ceremony. Invitations were sent out a couple weeks prior to have a few friends and supporters over to see the final spike being driven into the track. Kevin Pyle brought a spike maul, used for driving spikes on the prototype, and I figured “why not?” Using the spike maul and a nail set was a little awkward, but it didn’t take more than three taps with that huge hammer to set the spike in place. Cam received the honour of driving the final spike. He initially declined to use the spike maul but decided to use it for the “shiggles” factor. Here is where I would insert a link to the video that was shot, but stupid me shot Cam’s video upside down and thankfully software exists to rotate the video to be right side up, but I just don’t have time at this time of year to edit it and make a better product so you’ll have to visit this page later to see the video. After the spikes were set in place, trains were fired up and run over most of the layout. I say most because quite a few servos were not yet installed into Port Alberni yard so switching there wasn’t done much. Since that date, more work was done in getting the servos installed and hooked up to the Tam Valley Depot Octopus III controllers. After some discussion with Kevin Rudko of Signalogic Systems, it was discovered that his switch control panels intended for use with his switch controllers would actually work with the Octopus controllers, with only some slight wiring tweaks. The only real hitch is that using momentary switch inputs could lead to some undesired action on the servos, but time will tell whether this was going to be a huge concern or not. 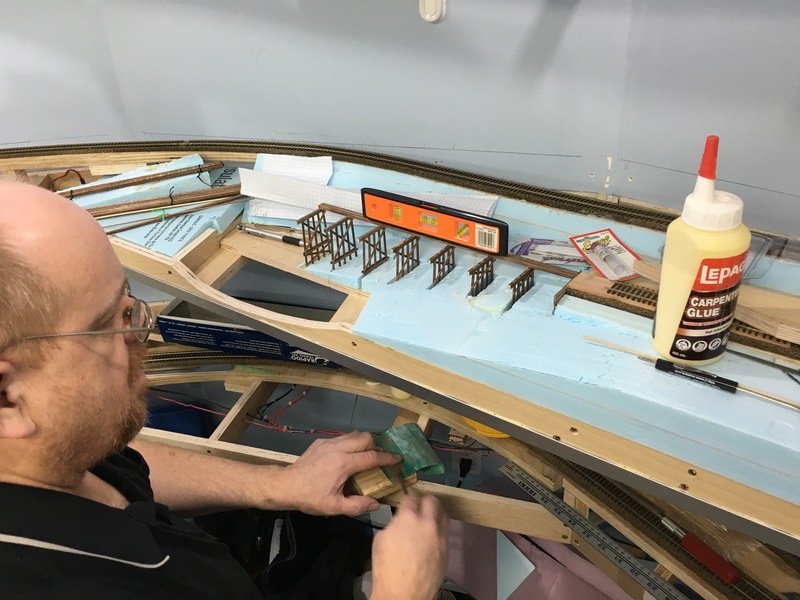 The next major event would be the Calgary Model Railway Society’s Layout Tours, happening at the end of February. Much cleaning was done, trains staged and switch lists generated, and my huge thanks to Dave Chomyn for coming over to run those trains during the six hours that the tour was running. We had 44 people over to see the layout that Sunday, which for me, was a huge success. Lots of people left favourable comments in the guest book, one guy who came over with a hatred for multi-deck layouts left quite impressed and now considering the idea has merit, and even a few women were impressed. Virtually all of them will be back for future tours to see how the scenery is progressing, and see how many of the “thousands upon thousands of trees” I’ve planted! Of course, I’m also heavily involved in the organizing of SUPERTRAIN, Canada’s Largest Model Train Show. This year, I’m working on the Registrar duties (thanks to Jim Ironside for being my co-registrar), graphics design and printing, and new this year, organizing the Shuttle Bus operation between a large Transit park and ride lot and the show venue. Being able to combine my transit-geek and friendships with a bunch of bus drivers to help the show has been quite rewarding. This show takes up a lot of my time in the few months leading up to the show and I’m thankful for the opportunity to even get downstairs every now and then. At some point I’ll be able to get back to the GP9’s that are needing to be completed, get some more scenery work done and who knows what else… Until then, keep your stick on the ice. This entry was posted on April 2, 2016. It was filed under Unassigned. Nice to see any update. I wish Jason would update Kingston Sub too. (and I should do something on Long Marton, but that would involve working on the railroad (gasp!) first, instead of using it as a table for Lego (the bridge is currently sitting on it), and as the collection point for my stock to take to Toronto in a week. We’re showing the BRMoV layout at Great British Train Show. 40+ hrs of driving to take it there.